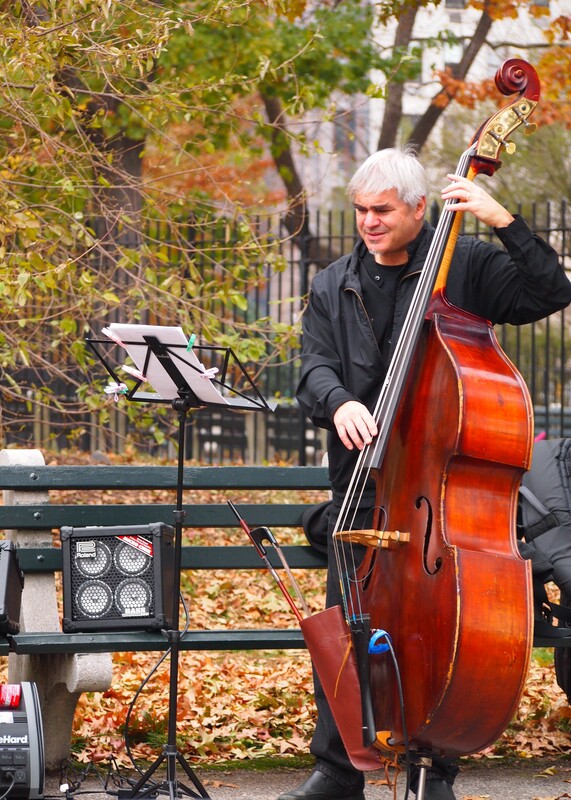 The first Jazz & Colors Festival brought a string of small musical miracles to Central Park on Saturday. Just five weeks after they were given permission to go head, the organizers of this pilot event found 30 ensembles and scattered them throughout the park. In glades, atop bridges, next to playgrounds and by the roadsides we found them, each group offering its own spin on the same 18 jazz standards. The result was as promised – a whole new landscape painted 30 different colors of Fall. All the ensembles, mostly trios and quartets, worked through classics like Billy Strayhorn’s Take the A Train, Fall, by the Miles Davis Quartet and Charles Mingus’ lovely Nostalgia in Times Square. 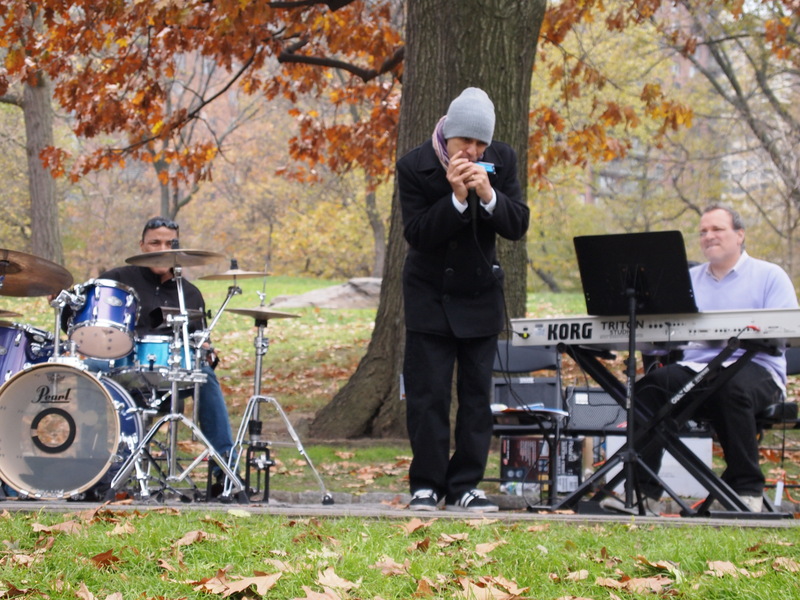 If you were on the East side and you timed it just right, you could, for example, see Marc Cary stationed in front of the Jacqueline Onassis Reservoir at East 90th Street, play Scrapple from the Apple on his Melodica (blow-organ), then make it to the lawn between the Metropolitan Museum of Art and the hot sugared nuts vendor, for the Roy Campbell Tazz Quartet’s own Scrapple –on trumpet. 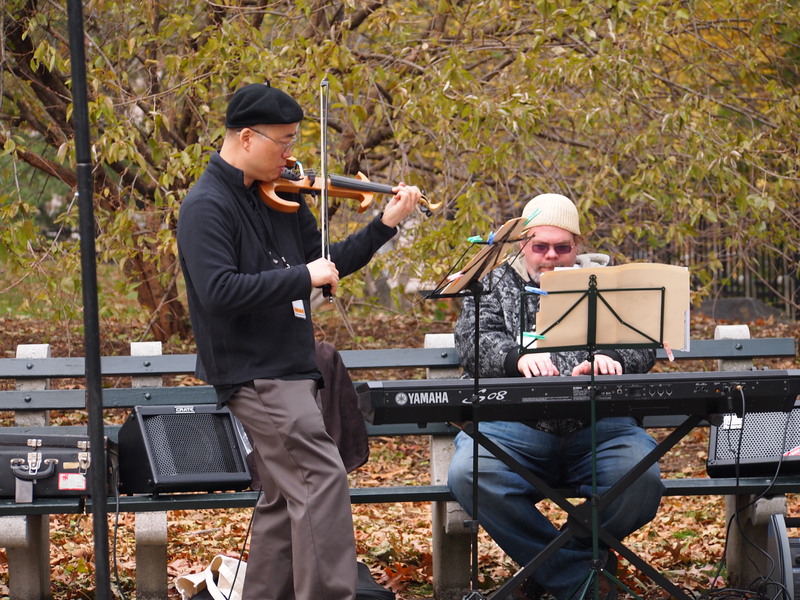 Our tour began at the West 85th Street playground where the Jason Kao Hwang Trio were wrapping up Autumn Serenade and launching into Goodbye, Pork Pie Hat. This was song no.7 of nine in the first set, so we were off to late start. We headed north and reached 90th Street as rockjazz pianist Elew was in the final throes of his own raucous rendition of Pork Pie Hat. 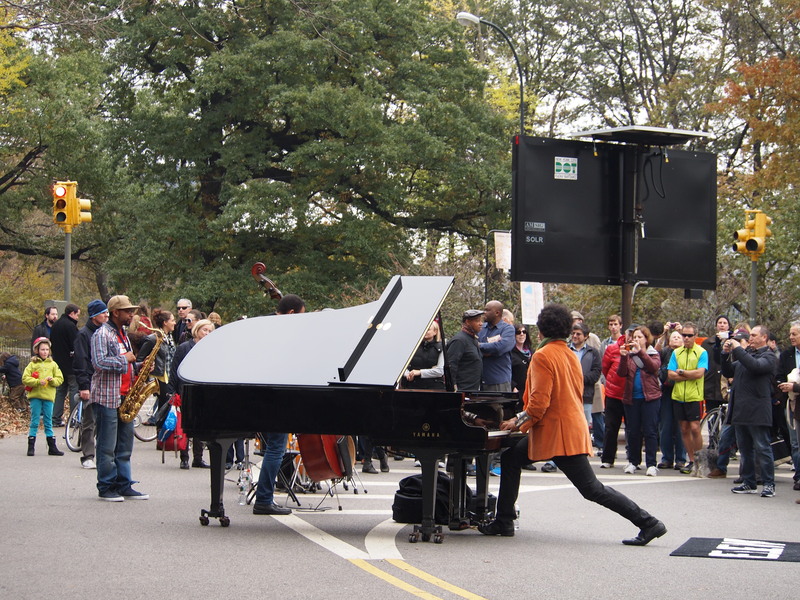 It’s hard to pass by a grand piano in the middle of the road and a small crowd had amassed around the charismatic quartet. After setting the scene he promptly silenced it, with a quietly soaring version of Rodgers and Hart’s Manhattan. 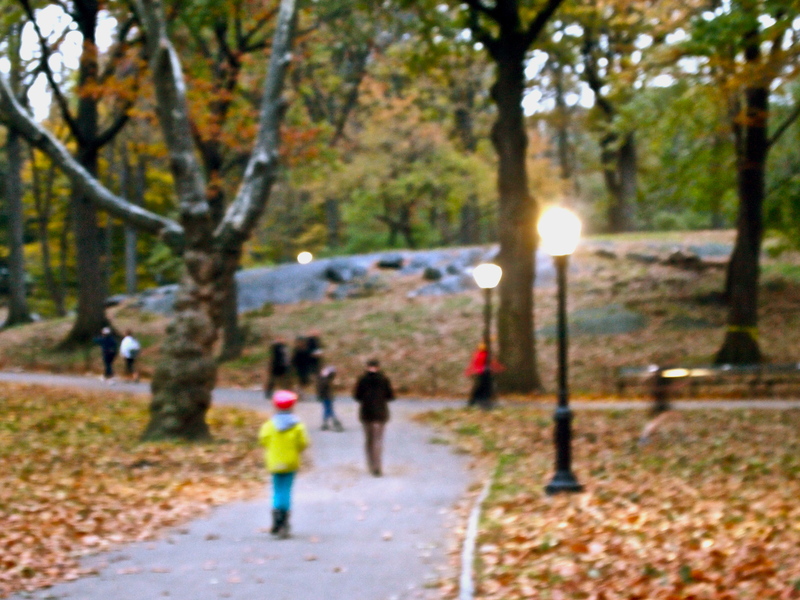 Joggers, dog-walkers, families with strollers, tourists – no-one within earshot escaped the reverie. 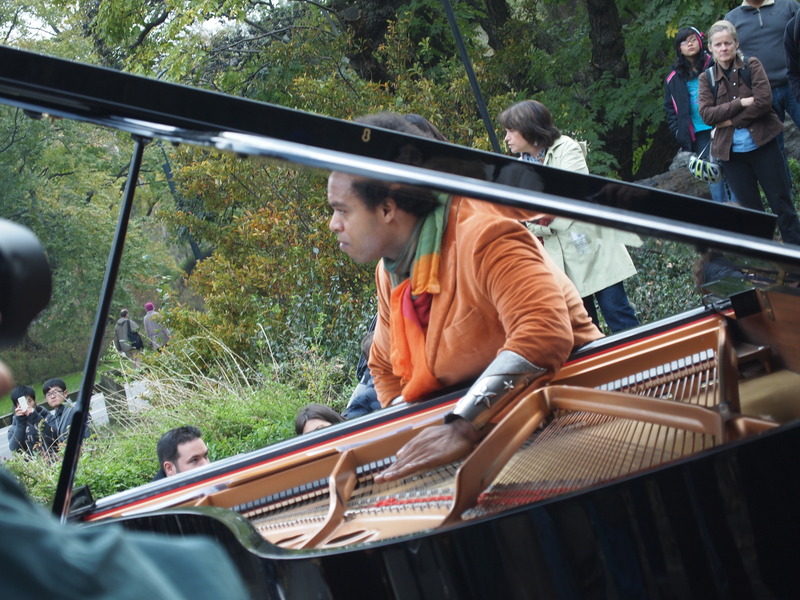 Elew (Eric Lewis) muted his piano keys like guitar strings and leaves skittered up the road in the breeze to accompany the rustling snare. The bassist found his moments and gently interceded. Innocent passers-by, pulled out of their afternoon by the lull, failed to pass by. It ended too soon. A whoop went up from the crowd and like that we were all released back into our day. Next came John Coltrane’s Blue Train then intermission. We paused to check out the quidditch match (yes really!) on the lawn and spent the rest of intermission at the 100th Street playground. Travelling with children, you learn to recognize when you’ve seen “the one” – that thing that allows you to leave peacefully if there’s a mutiny. I had my highlight and was happy to roll with the punches from then on. As intermission ended we decided to cross over to the east side and make our way down to the Naumberg Bandshell in time to see the Mingus Big Band finish up the second set. We would see what we would see along the way. Even on bikes and carrying a few leftovers from our Halloween stash, we were never going to make it from 85th Street up to the Harlem Meer to see Marika Hughes and Bottom Heavy or down to Pinebank Arch to see Lakecia Benjamin and Soul Squad. We saw seven of the 30 groups, for about a half to one or two songs each – it was more than enough for each of us to go home with a buzz. Ever the romantic, Ruby was taken by the atmosphere on the carriage bridge between Cedar Hill (our sledding Hill) and the Alice in Wonderland statue (the best climbing spot in a park full of non-climbing trees). She became besotted with Sharel Cassity Quintet’s Skating in Central Park,. Henry’s favourite was the terribly cool, “anchor-shaped” electric violin played by Jason Kao Hwang. And the afore-mentioned blow-organ – he’s all about process! Without really trying, our timing was perfect. We reached the Mingus Big Band at 3:40, just as the pre-dusk cold started to creep in. After spending the afternoon hanging out with little clusters of impromptu audiences, the three of us stopped paying attention when we joined the huge stationery crowd at the Bandshell. However we still got our big finale as Empire State of Mind closed the set. The crowd went as wild as a jazz crowd can. On the way back to our exit, we met a friendly drum teacher watching the lake. 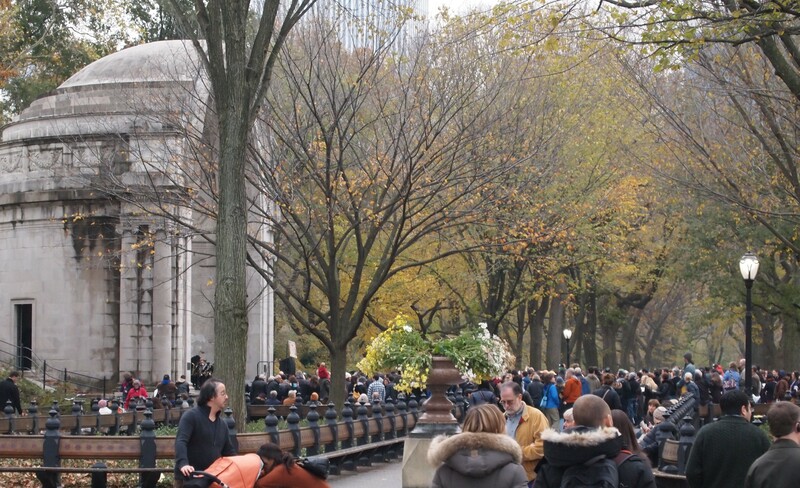 Like nearly everyone else in the park that day, she had stumbled upon this fantastic free event. Between her and a few other walkers stopping to compare who saw whom play what, it was unanimous: On Central Park’s busy events schedule this one was a keeper – well timed, well-managed and well worth adding to next year’s calendar now.